The breathtaking and panoramic view from Sunrise Mountain along the Appalachian Trail rewards the hiker who has trekked up the steep side of the mountain. The view encompasses the pastoral farmland of New Jersey to the east and undeveloped forests and mountain ridges to the west. For those who don’t relish the idea of climbing up the side of a mountain and following a sometimes rocky and steep trail for a few hours, there is a short drive to the pavilion at the top of the mountain. Stokes is famous for its impressive beauty, whether it is at the top of a mountain ridge or in the cool and fragrant Tillman Ravine with its rushing stream and steep cliffs. Hikers, campers, fishermen and photographers are attracted to its wild setting. The following seasonal roads within Stokes State Forest are now open. This year we are looking forward to lots of summer fun with kayak rentals and archery programs offered on the weekends. Check with the Forest Office for more information. The crest of Sunrise Mountain is one of the most frequently visited sites in Stokes State Forest. The mountaintop provides a breathtaking view at an elevation of 1,653 feet above sea level. The thin soil and harsh climate characteristic of Sunrise Mountain is a difficult environment in which few plants can survive. Mountain laurel, wild blueberry, pitch pine and scrub oak are among the natural vegetation found throughout the area. The pavilion at the summit was built in the late 1930s by the Civilian Conservation Corps. The Appalachian Trail runs along the ridge. This cool evergreen forest of eastern hemlock is ideally suited for the steep slopes carved by the rushing waters of Tillman Brook. Several trails wander through this spectacular ravine, providing views of waterfalls and ferns clinging to rock crevices. The area is home to the threatened barred owl and other endangered species. If the total fee is greater than or equal to $50.00 then a fee of $5.00 will be charged. If the total fee is less than $50.00 then the fee of $2.00 will be charged. Pet Friendly Campsites please click here for details on sites that are designated Pet Friendly, license and innoculation paperwork requirements and additional cost. Pet friendly sites are family campsites #101-137. Campsites: 82 tent and trailer sites with fire rings and picnic tables. Some camping areas available all year. Fee: NJ Resident: $20 per night; Non Resident: $25 per night. Accommodates up to 6 people, including children. Steam Mill Camping Area - 27 tent and pop-up camper sites with an artisan well for water and pit toilets. All sites have a picnic table, fire rings and lantern hooks. Fee: NJ Resident: $20 per night; Non-Resident: $25 per night. Group campsites: Nine (Ten) group sites located at Haskins with fire rings and picnic tables. Open April 15 to October 31. Campsites A, B, C, D, E, and F accommodate up to 30 people. Fee: NJ Resident $60 per night; Non Resident $120 per night. Campsite G accommodates up to 65 people. Fee: NJ Resident $130 per night; Non Resident $260 per night. Campsite H accommodates up to 10 people. Fee: NJ Resident $20 per night; Non Resident $40 per night. Campsite I accommodates up to 45 people. Fee: NJ Resident $90 per night; Non Resident $180 per night. Campsite Z, located at Lake Ashroe accommodates up to 40 people. Parking is not allowed on the campsite, but there is a designated park area. Fee: NJ Residents $80 per night; Non Resident $160 per night. 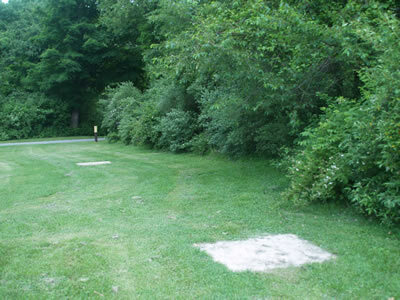 Horseshoe pits have been added to the group campsites and one location at Lake Ocquittunk. Please bring your own horseshoes and spikes. Group Lean-tos: Located at Lake Ashroe. GL-X has 3 lean-tos and accommodates 5 people each for a total of 18 people. Fee: NJ Resident $105 per night: Non Resident $120 per night. GL-Y has 5 lean-tos and accommodates 4 people each for a total of 20 people. Fee: NJ Resident $125 per night: Non Resident $150 per night. The site is hike in only. Parking is located at Group Site Z. Each lean-to has a charcoal grill and each group site has 2 fire rings and multiple lantern hooks. There is no wood stove for heat. Cabins: Ten furnished cabins each with wood stove; two single beds; one double-deck bunk; kitchen with cold and hot running water, refrigerator, electric stove; half-bath with toilet and sink. Electric lights. Each accommodates four people. Cabins are adjacent to Lake Ocquittunk. Fee: NJ Resident $55 per night; $385 per week; Non Resident $65 per night; $455 per week. Cabins 7 & 12 Accommodates eight people. Facilities are the same as listed above, except they include a shower and hot and cold running water. Cabin 7 has a fireplace and Cabin 12 has a wood stove. Accommodates people with disabilities. Located 1/2 mile from Lake Ocquittunk. Fee: NJ Resident $100 per night; $700 per week; Non Resident $110 per night; $770 per week. Group Cabin 13: Accommodates twelve people. Facilities includes two sleeping areas and two full bathrooms and a Fireplace. Located one mile from Lake Ocquittunk. Fee: NJ Resident $140 per night; $980 per week; Non Resident $150 per night; $1,050 per week. Wood is not provided. You can buy it at the park office for $7 a bundle. You need to bring sheets, towels and cooking utensils. There are no small appliances such as a coffee maker, toaster or microwave. Outside the cabins there is a picnic table, fire ring and charcoal grill. Cabins must be reserved for seven or fourteen consecutive nights only during the summer months. Cabins may be reserved for a minimum of two consecutive nights to a maximum of fourteen consecutive nights during the off season. Check the camping website, www.camping.nj.gov, or call the park office for when the cabins open and close. Stocked annually by the Division of Fish & Wildlife, the Big Flatbrook and its tributaries provide some of the best trout fishing in New Jersey. Lake Ocquittunk and Stony Lake also are stocked with trout. The majority of the forest is open to hunting. Both fishing and hunting at Stokes State Forest are subject to the New Jersey Division of Fish and Wildlife regulations. Stokes State Forest offers 2 picnic areas Stony Lake and Kittle Field. The Group Picnic Area at Kittle Field has a capacity of 100 people, provides shelter, playfields and playground equipment. It may be reserved for a fee. Reserving the shelter at Kittle Field does not guarantee the exclusive use of all picnic tables, grills, parking spaces, playground, sports field and/or sanitary facilities at Kittle Field. Rental of the shelter at Kittle Field gives you and your group exclusive use of the shelter, picnic tables within the shelter, two large steel pedestal charcoal grills outside the shelter and 4 picnic tables outside the shelter. The Stony Lake picnic area has 45 tables with adjacent grills located next to the swimming area. This area is not reservable. Small boats with electric motors are only permitted on the waters of Lake Ocquittunk and are subject to all applicable boating laws. There is no boat ramp. Swimming is permitted in Stony Lake while lifeguards are on duty. Please check our swimming schedule prior to your visit.Visitors will find a beach complex containing changing area, restrooms a first-aid station and picnic facilities. Inner tubes, rafts and other flotation devices are not permitted in the swimming area. Only Coast Guard approved life jackets are permitted. Pets are prohibited on the beach. Horseshoe pits have been added to the Stony Lake beach area. Please bring your own horseshoes and spikes. Along Kittatinny Mountain are outstanding views of the surrounding landscape. Sunrise Mountain offers scenic vistas of the Kittatinny Valley to the east and the Delaware River Valley to the west. 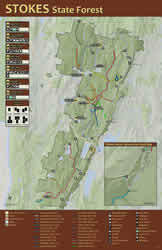 In addition to the Applachian Trail, there are more than 33 miles of marked trails within Stokes State Forest. Trails vary in length from one half mile to four miles, and over terrains ranging from flat lowlands to rocky mountains. Many of the trails connect, offering the hiker a variety of trips from an hour to a full day. 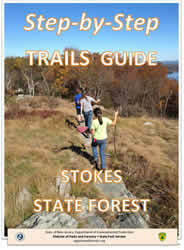 12.5 miles of the Appalachian Trail follows the Kittatinny Mountain Ridge through Stokes State Forest. This trail's designated use is restricted to hiking only for its entire length from Maine to Georgia. White blazes mark this narrow and sometimes very rocky trail. There are 2 designated overnight shelters: Brink Road Shelter and Gren Anderson Shelter. These are the only overnight locations that allow you to stay overnight on the trail. Camping is limited to 1 night per shelter. Limited water sources can be found via a spring at both shelters. You should plan to carry sufficient water for your hike as water along the trail may not be available. All water obtained along the trail should be chemically treated or boiled for 5 minutes. Can I rent equipment at Stokes State Forest? Stokes does not rent any equipment. All equipment must be provided by the patron, i.e. boats, horses, bikes, etc.